The refrigerator was the first to meet 2014 Federal Energy Standards all while having an extremely large, 28 cubic foot capacity. With many great features such as the Twin Cooling Plus System™ which keeps refrigerator humidity high and and freezer conditions dry and CoolSelect Pantry™ with temperature control which allows you to select a temperature that is appropriate for the type of food in the space. Also featuring a space saving ice machine, premium filtered water, EZ-Open Handle™ freezer handle, two humidity-controlled crispers, high efficiency LED lightingtempered glass spill-proof shelves and auto pull-out upper freezer drawer, this refrigerator has everything to you need to keep you and your family satisfied. The French Door Refrigerators 28 cu. ft. French Door Refrigerator with CoolSelect Pantry™ by Samsung Appliances at Furniture Fair - North Carolina in the Jacksonville, Greenville, Goldsboro, New Bern, Rocky Mount, Wilmington NC area. Product availability may vary. Contact us for the most current availability on this product. Capacity: Refrigerator 19.14 Cu. Ft.
Capacity: Freezer 8.93 Cu. Ft.
Capacity: Total 28.07 Cu. Ft. Depth without Door or Handles 33.5"
Depth with Door at 90° 48.25"
Massive storage capacity on the inside, with a slim profile on the outside and the most advanced conveniences built in, Samsung French Door refrigerators raise the bar on style, efficiency and modern living. These refrigerators can have up to 29 cu. ft. of interior space, the equivalent of adding a mini fridge to a standard model with minimal increases in exterior size. Select Samsung French Door Refrigerators also feature a flexible, bottom right door that can change to a fridge or freezer, maximizing fresh food storage. 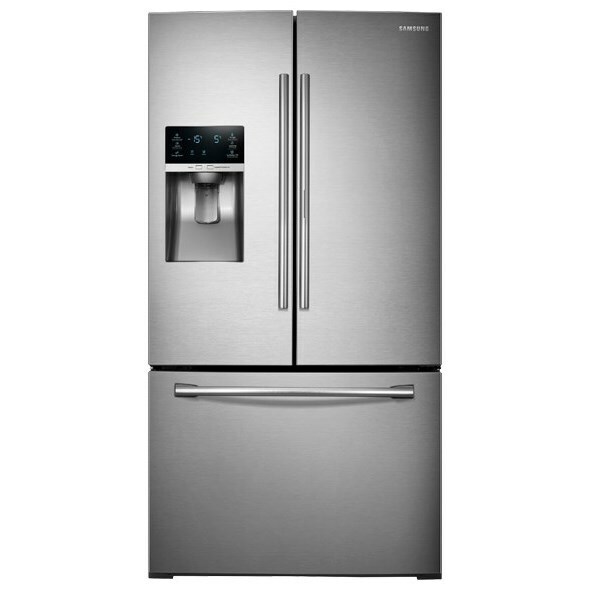 Even with all the additional space, Samsung has the most energy efficient line of french door refrigerators. The French Door Refrigerators collection is a great option if you are looking for Appliances in the Jacksonville, Greenville, Goldsboro, New Bern, Rocky Mount, Wilmington NC area. Browse other items in the French Door Refrigerators collection from Furniture Fair - North Carolina in the Jacksonville, Greenville, Goldsboro, New Bern, Rocky Mount, Wilmington NC area.